Today, August 26th, marks the 104th birthday of Mother Teresa. Born in Macedonia in 1910, her life story and selfless service is recognized all over the world. Using her life as her sermon, she will always be regarded as a great humanitarian who worked continuously to help those most in need. Originally named ‘Agnes’ (Gonxha) by her parents, she was the youngest of three children. Her father died suddenly when she was just eight year old, leaving her mother to singly raise the family in a way that deeply influenced one woman’s character and future commitment to charity. 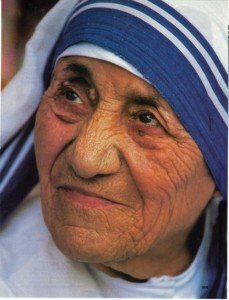 Irish people always feel a special connection with Mother Teresa, knowing that she choose to come to Dublin when was just 18. It was here she joined the Loreto Sisters and first received the name ‘Sister Mary Teresa’. While she spent time as a novice in Dublin, she was known as “very small, quiet and shy”. For 17 years in India, she devoted her life to teaching children, caring for the sick and the poor. Using donations from people all over the world, she built homes for people who had no place to live. She established many centres for people living with AIDS, at a time when those suffering were shunned even by their own families. She also started an open-air school and a home for the dying destitute in a dilapidated building she convinced the government to donate to her cause. Even as she grew old and lost her strength, she continued to work all over the world. Her legend still lives on, and she will forever be remembered for her extreme acts of love and kindness, her work with children, the sick, poor, orphaned and dying. We at ChildFund hope that Mother Teresa’s legacy will live on, and that she continues to inspire everyone, especially those who are working with underprivileged women and children.